Becky Melton has made significant contributions to EDGE&TA Branch 28. She has been in charge of the kitchen crew (cook shack) for all functions of Branch 28. This includes two shows annually, a fun pull, a Christmas Dinner and food shack duties at several antique tractor pulls that we organize in neighboring communities. She volunteers in other ways including the sign-in booth, advertising and educational activities and she announces the 2 daily parades. She is one of the people that you want to know. 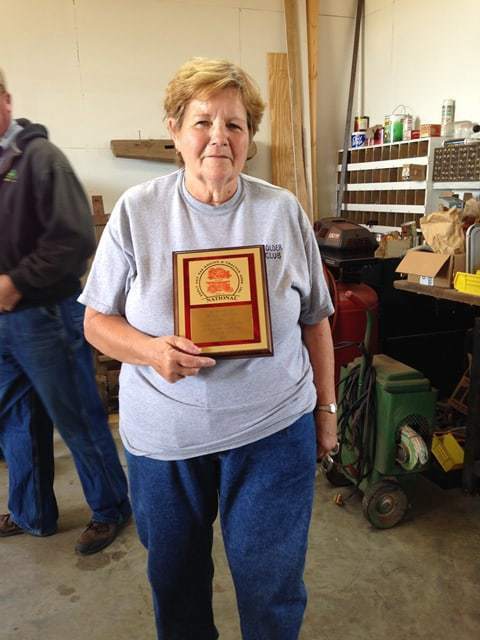 We would like to honor this person mainly for her dedication over the past several years as our food shack supervisor. She is in charge of purchasing supplies, creating the menu and serving the visitors to our activities. She will however take time from these duties to participate in the tractor parades and pulling competition during our shows. Becky also helps with the advertising of our events and even made a quilt to raffle to help raise funds for the club. She encourages family members and other persons to keep the club active and provide educational activities in our community and surrounding areas. She is not one that goes after the glory of being in charge of these events. She is a people person and always meets you with a smile. You may think, what does the cook shack has to do with EDGETA. When you go to a show you always want to know where you are going to eat. Branch 28 doesn’t charge admission at their gate. They make their money from the food service and advertising in the community. Becky has worked tirelessly over the past twenty or more years in helping Branch 28 to reach its goals and dreams. She owns several tractors that she drives in parades and tractor trail rides. She also is an active member of our growing list of antique pullers group. She helps a tremendous amount in the exhibition of all antique equipment. As supervisor for our food serving area, she is very aware of the need to raise money to support all of the activities of EDGE&TA Branch 28. What are some of her other duties: Becky and her husband own a dairy farm and Becky does most of the milking operation and other farm duties while her husband owned bulk milk trucks and was gone from home a lot. Becky is the wife of Branch 28 President. She fields a lot of the calls about branch business and most of the time if you want to know what is going on, just call Becky. Becky always has a smile on her face even if she is in pain from all the farm duties. Our organization needs more people like Becky. This is the reason we think Becky Melton deserves the honor of being inducted into the EDGETA Hall of Fame.